Do you love what imaginative play can do for kids? I certainly do. Here's a children's picture book that celebrates imaginative play. 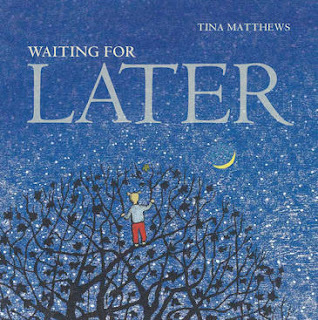 Waiting for Later was written and illustrated by Tina Matthews, and published by Walker Books. Later never seems to come soon enough! But sometimes waiting for later can be full of surprises. Even though Nancy is big, one day she feels small. She asks her mum, brother, cousin, aunt and grandfather to play with her. They’re all busy and inevitably reply, “Later.” So Nancy climbs a tree in her backyard to wait for later, and imagines playing the games her family doesn’t have time for. When later arrives, it’s her family who wonder where Nancy’s got to. Kids will immediately empathize with Nancy. How many times are we told as children, "Not yet." or "In a little while."? Consumed with impatience, we jiggle from foot to foot, or ask our question again, or eventually, like Nancy, give up the pestering and use our imaginations instead. And that feeling of being small, when you know you're a big girl really, can strike us all, I think, when it seems the people in our lives are just too busy to find time for us. As is usual with excellent children's picture books, I found myself appreciating the illustrations just as much as the text. Matthews has created atmospheric art work using Japanese woodcuts and stencils. I think children will enjoy the silhouettes, too, especially identifying who they represent and what they're doing. Through Nancy's eyes, we see and appreciate the natural world and her family's world, and how they interrelate. Walker Books have added tremendous value to Waiting for Later with the resources on their website. Teacher, parents and librarians will appreciate that they are free to download Waiting for Later Classroom Ideas as a pdf. There are great suggestions inside to use as discussion starters and learning activities. Waiting for Later was short-listed for the 2011 Queensland Premier’s Literary Awards, Children’s Book - Mary Ryan’s Award. Oh, yes, my kind of book! Will look out for this one. Thanks. @JeanneAha! "Japanese woodcuts" lure you, I bet!